Peter D. Parks, one of the industry's foremost microphotographers, has received the Gordon E. Sawyer Award, voted by the Board of Governors of the Academy of Motion Picture Arts and Sciences. To Kish Sadhvani for the concept and optical design, Paul Duclos for the practical realization and production engineering and Carl Pernicone for the mechanical design and engineering of the portable cine viewfinder system known as the Ultimate Director's Finder (UDF). This versatile, modular and widely accepted cine viewfinder system is capable of properly displaying images in multiple formats ranging from 35mm anamorphic to super 16. To Henrik Wann Jensen, Stephen R. Marschner and Pat Hanrahan for their pioneering research in simulating subsurface scattering of light in translucent materials as presented in their paper "A Practical Model for Subsurface Light Transport." This mathematical model contributed substantially to the development and implementation of practical techniques for simulating subsurface scattering of light in translucent materials for computer-generated images in motion pictures. To Christophe Hery, Ken McGaugh and Joe Letteri for their groundbreaking implementations of practical methods for rendering skin and other translucent materials using subsurface scattering techniques. Kinoton FP 30/38 EC II Studio Projector. This high-speed studio projector produces an image quality equal to projectors with Geneva movements. With its unparalleled shuttle speed, reversibility and acceleration this projector has set a new standard for post-production viewing as well as in traditional screening facilities. To Kenneth L. Tingler, Charles C. Anderson, Diane E. Kestner, and Brian A. Schell of the Eastman Kodak Company, for the successful development of a process-surviving antistatic layer technology for motion picture film. This technology successfully controls the static charge buildup on processed intermediate and sound negative films during high-speed printing operations. 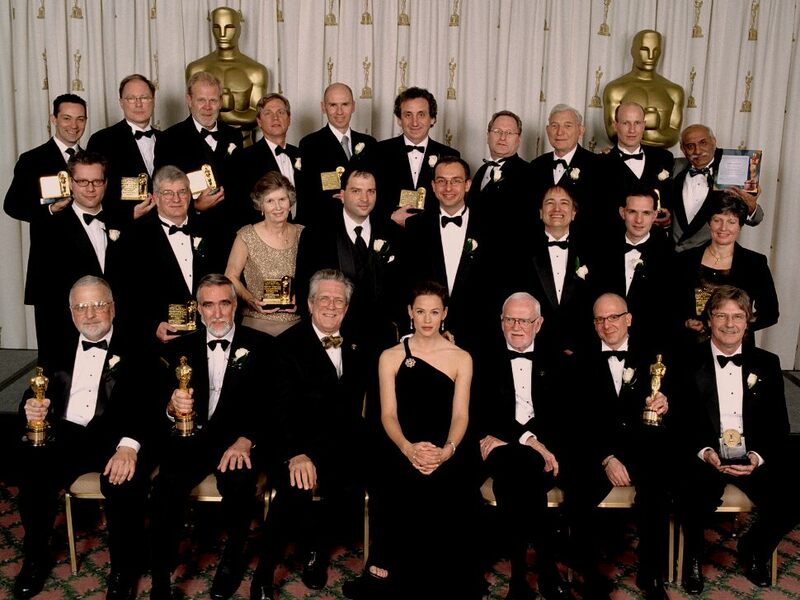 To Christopher Alfred, Andrew J. Cannon, Michael C. Carlos, Mark Crabtree, Chuck Grindstaff, and John Melanson for their significant contributions to the evolution of digital audio editing for motion picture post production. Through their respective pioneering efforts with AMS AudioFile, Waveframe and Fairlight, their work contributed significantly to the development and realization of digital audio workstations with full editing capabilities for motion picture soundtracks. To Stephen Regelous for the design and development of Massive, the autonomous agent animation system used for the battle sequences in "The Lord of the Rings" trilogy. To Digidesign for the design, development and implementation of the Pro Tools® digital audio workstation. The efficient algorithms, extensible architecture and intuitive interface have enabled Pro Tools® to become the worldwide standard for the creation and editing of motion picture soundtracks. To Bill Tondreau of Kuper Controls for his significant advancements in the field of motion control technology for motion picture visual effects. Measuring his valuable contributions to the invention and implementation of robotic camera systems in decades rather than years, his efforts have aided motion control in becoming a core technology that has supported the renaissance of visual effects.